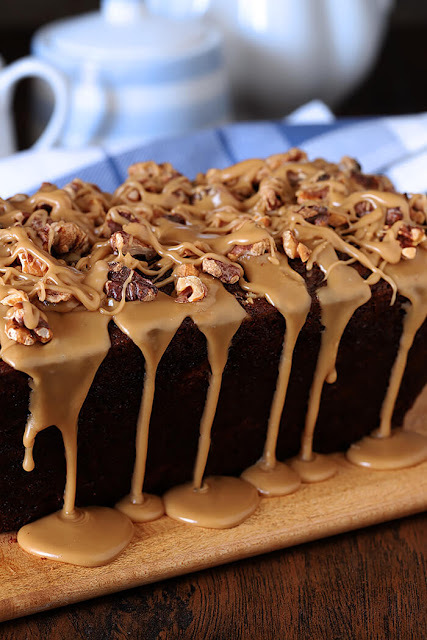 This Date Coffee Cake with Walnuts and Espresso Glaze is so rich and full of flavor, you’ll enjoy it with coffee for breakfast or a salad with dinner. 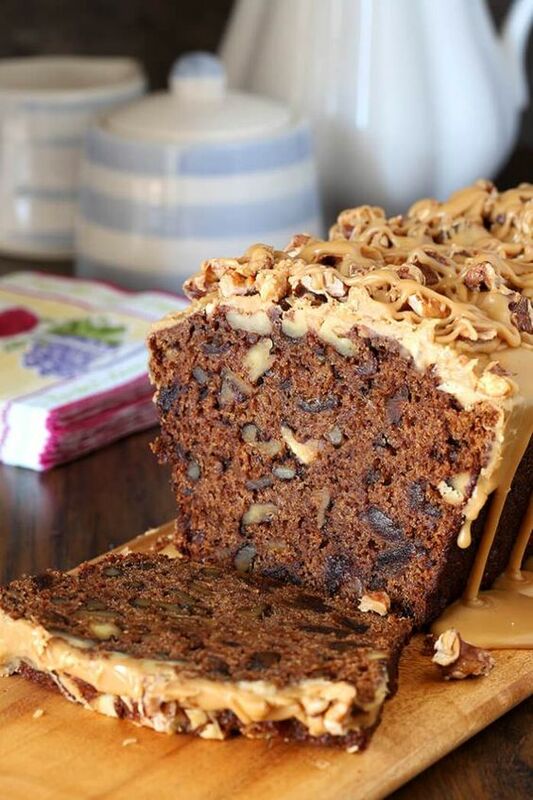 Espresso soaked dates and toasted walnuts are the star of the show and the espresso glaze the literal icing on the cake! When I say it’s loaded with espresso-soaked dates and walnuts I’m not kidding. This is how I like my ‘breads’ – chock full of the goodness that is advertised. That coffee glaze is decadent in itself and adding some more toasted walnuts on the top, while born mostly from having toasted too many, was a good idea. I used to hate walnuts. Toasting them changed EVERYTHING…who knew I just didn’t like them raw. In a large bowl, combine the dates, hot coffee or espresso, and baking soda. Set aside. In a small bowl, combine the flour, cinnamon, nutmeg, and salt. Using a mixer beat the butter and sugars together. Strain date mixture and set dates aside. Add the liquid from the date mixture alternately with the flour mixture (about three times) to the ingredients in the bowl; ending with the liquid. Scrape bowl well and beat just til smooth. Fold in the dates and toasted walnuts. Grease a 9x5-inch loaf pan with butter or baking spray. Cut parchment paper to fit the bottom and sides of the pan and spray the parchment. Pour the batter into the greased and parchment paper-lined loaf pan. Bake for 55-65 minutes, or until a toothpick inserted near the center comes out clean. Cool for 20 minutes before removing from pan; peel off parchment and put on a wire rack to cool completely. Combine the hot water with the dry espresso and stir until blended. In a small bowl, whisk together the powdered sugar, melted butter, vanilla, and espresso. If it needs to be thinner, add 1/2 tsp of hot water at a time to get desired consistency. Drizzle the Espresso glaze over the cooled bread and scatter the chopped walnuts on top. Let cool until the glaze sets before cutting. 0 Response to "Date Coffee Cake with Walnuts and Espresso Glaze"